I have always been a fan of neon signs and art. Years ago, there was a child in my class whose dad was a neon sign creator. I was fascinated by the process and he invited to me to his shop to see the production of a new sign. He would also repair neon signs. I was amazed at the process! Not only must an artist be creative, they are glass blowers, chemists and electrical engineers. Here is a detailed About Page that goes through the process and the gases you combine with neon and mercury to create different colours. This past week I made my way to Disneyland Resort in California to celebrate a friends birthday (her 40th – shhhh). Although I went under the pretence for her birthday, I was really interested in CarsLand, the Radiator Springs from Pixar’s Cars movie. It was like being in the movie. The detail was unbelievable! 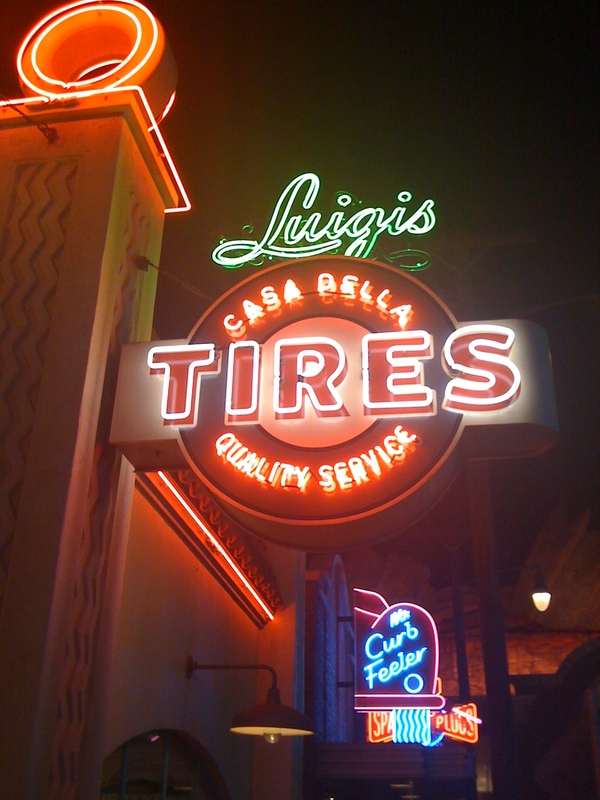 The purpose of my trip was to explore Radiator Springs at night time because the Imaginears used neon signage to make the place shine at night, just like in the movie. It truly became a different place. John Lasseter sent his Imaginears across the United States to get a feel for how route 66 use to be. They came back armed with ideas from quirky to beautiful to down right amazing. 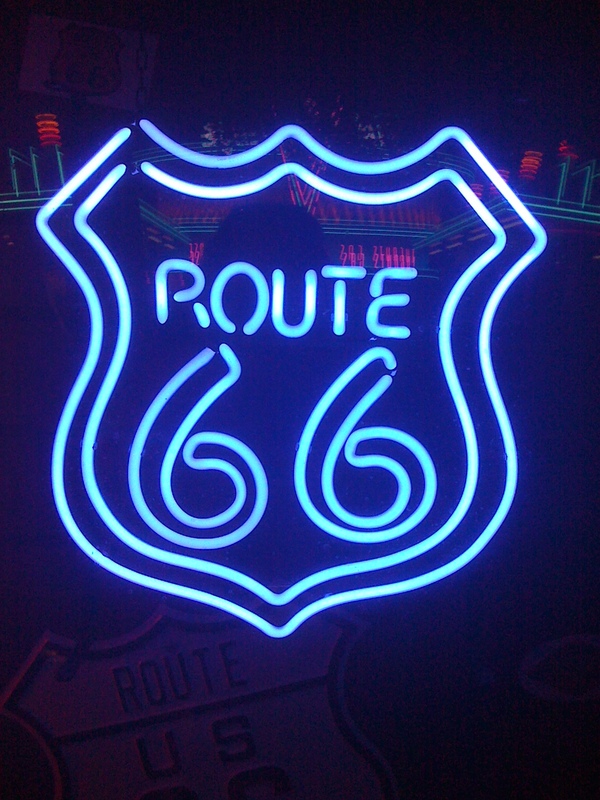 Wondering down route 66 at night was akin to looking at Christmas lights. The colour and sparkle was a sight to behold! 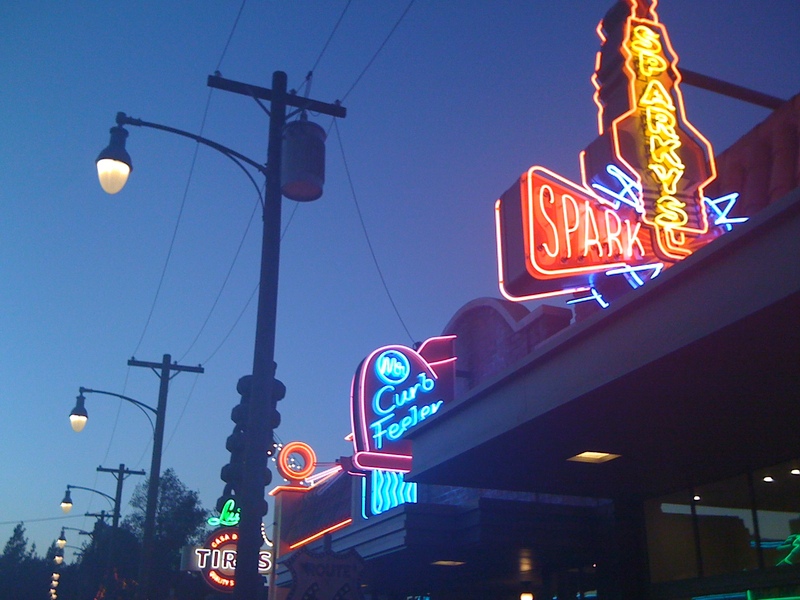 I spent 2 or my 3 nights exploring Radiator Springs and taking in the breath taking beauty of neon. Knowing the labor intensive methods and the craftmanship involved makes these signs into works of art. Stunning! I just showed your photos to my kids and they are LOSING THEIR MINDS. Evidently, we are going to be heading to California in the spring! Come find me on Facebook, they can see all my Disneyland photos and die from delight! Those neon signs are really cool. I’ve never been to Disneyland, but this sounds like something really fun to check out if I ever go there. I’m glad you had a good trip! I’m a sucker for neon, too – even without knowing any of the science behind it. I just think the bright lights are pretty. AHHH I love that place! I love the neon, the throwback atmosphere, and the Mobile Cone Ice Cream Shop! Sigh….this girl needs a little more Disney in her life!